(Bridgewater, N.J., Sept. 23, 2017) – The Long Island Ducks defeated the Somerset Patriots 4-3 on Saturday night in Game Four of the Liberty Division Championship Series at TD Bank Ballpark. The Ducks won the series three games to one and are the 2017 Liberty Division champions. This marks the second consecutive season that the Ducks defeated the Patriots to claim the division crown. Long Island rallied from a 2-0 series deficit to defeat Somerset in the 2016 Liberty Division Championship Series. 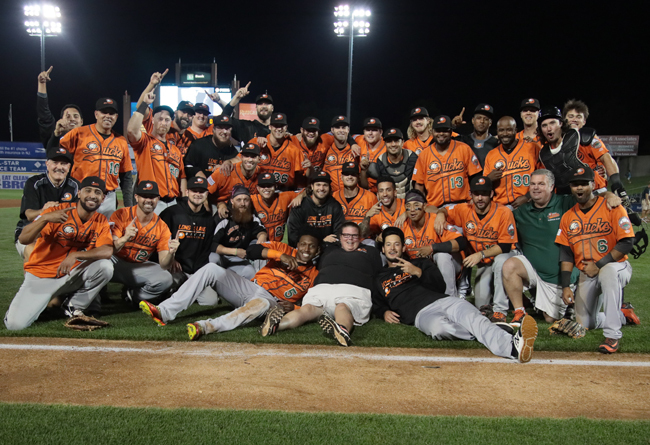 The Ducks have now won the Liberty Division championship five times in the past seven seasons, all with Kevin Baez as the team’s manager, and have earned six division titles in franchise history (2004, ’11, ’12, ’13, ’16, ’17). After Ducks starter Jake Dunning worked out of a second-and-third, no-out jam in the second inning, the Ducks opened the scoring in the third against Patriots starter Patrick Johnson. Delta Cleary Jr. scored from second base on Anthony Vega’s bunt single and a fielding error. Giovanny Alfonzo followed two batters later with an RBI single to right field, scoring Vega. Long Island extended their lead to 3-0 in the sixth when Marc Krauss singled to right and Angelo Songco followed with an RBI double to right-center. Somerset got on the scoreboard in the bottom of the frame when D’Vontrey Richardson doubled and scored from third with two outs on an RBI infield single from Carlos Guzman off Ducks starter Jake Dunning. It stayed that way until the eighth when the Patriots rallied with two outs to tie the game at three. RBI singles by Guzman and Yovan Gonzalez did the damage. Long Island answered right back though in the ninth to take a 4-3 lead. Vega walked to open the inning, Dan Lyons was hit by a pitch and both runners moved up on a wild pitch. That set the stage for Alfonzo, who drove in Vega with an RBI fielder’s choice grounder to third. Neither starter factored into the decision. Dunning pitched five and two-thirds innings, yielding one unearned run on seven hits and a walk while striking out three. Johnson lasted five and one-third innings, giving up three runs on six hits and a walk with three strikeouts. Amalio Diaz (1-0) collected the win after recording the final out of the eighth to keep the game tied and retiring the side in order in the ninth. Dustin Antolin (0-1) took the loss, surrendering the game-winning run in his two-thirds of an inning. Krauss led the Flock offensively with three hits, while Alfonzo added two RBI. The Ducks now advance to the Atlantic League Championship Series where they will take on the Freedom Division champion York Revolution. The Ducks will host Game One of the series on Wednesday, September 27 as well as Game Two on Thursday, September 28. First pitch for both games is scheduled for 6:35 p.m., with the Bethpage Ballpark gates opening at 5:35 (5:20 for full season ticket holders). The series will then shift to York, Pa. for Game Three on Friday, September 29. If necessary, Game Four will be on Saturday, September 30 and Game Five will take place Sunday, October 1. Tickets to Games One and Two of the ALCS are available online now by CLICKING HERE and via the Ducks mobile app. Fans can purchase tickets at the Bethpage Ballpark box office and by phone at (631) 940-TIXX beginning Monday, September 25 at 10:00 a.m. Those unable to make the game can follow all the action on the Long Island Ducks Broadcast Network. Live streaming HD video and audio will be available via BoxCast on the Ducks’ official Facebook page, YouTube channel and at LIDucks.com.